A necessary component to developing healthy emotions and having meaningful relationships is to know that we are unconditionally loved. Many of us look to others to feel loved, because many of us believe other human beings will validate for us that we are loveable. Maybe you have come to realize that human beings are not the source of unconditional love, because maybe you don’t unconditionally love yourself, or maybe you have been hurt, disappointed, or even abandoned by someone who said they loved you. Through many years of my own personal relationships with family, friends and marriage, as well as counseling thousands of clients about their own love relationships, I have come to understand the difference between human love and real love. Lets clarify this difference. There are two types of human love, passionate love and companionate love. Passionate love is a deep romantic or sexual attachment to someone, such as a romantic partner or spouse. Companionate love is a platonic, tender, personal attachment such as one you may have with a family member or best friend. Anyone who has experienced hurt from a romantic love relationship or been hurt by a best friend or family member knows that human love can cause great grief. There is really no guarantee that another person will love you back or stay in your life. On the flip side, anyone who still has lasting friendships or feels deeply loved and accepted by a partner, knows how amazing a loving relationship with another human being can be. Now that we understand the limits of human love, lets see how real Love is different. Real Love is limitless and lasts forever. It will heal your heart from past hurts other human beings have caused. And although we are not the source of real Love, we can practice and emulate real Love qualities in our relationships. God is the Source of Real Love. Not everybody knows that God is real Love. I was not taught this growing up. Learning this many years into my adulthood was a big shift in my perception of who or what God is. It also changed the relationship I had with God and myself; knowing that I was really Loved no matter how many times I made poor decisions, ruined opportunities and said things that made situations worse. 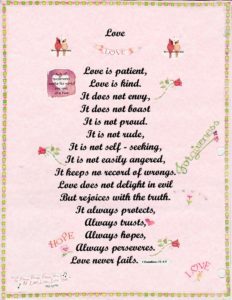 Let’s look at the qualities of real Love and see how they differ from human love. It does not rejoice about injustice but rejoices whenever truth wins out. Do you know any human being who expresses all these real Love qualities all the time? Do you express all these real Love qualities to yourself and everyone you encounter all the time? It is important to know that even if you don’t express real Love qualities, or others have not expressed real Love qualities with you, knowing and receiving real Love, will not only heal your past hurts by loved ones, but you can continue to have loving relationships, even with people who do not understand what real Love is. This is transformational! How can we acquire real Love qualities so that we can become more loving to our self and others? The first step is to ask God for more real Love, since God is the Source of it. “Keep on asking, and you will receive what you ask for. Keep on seeking and you will find. The third step is to be intentional about practicing real Love qualities with yourself and others. I decorated the above ‘qualities of real Love’ sheet and I have it hanging up in my bedroom. I read it often and ask myself the following questions, so I can hold myself accountable to become really loving. Am I being patient and kind with myself and others today? Am I jealous or acting proud or being rude to anyone today? Am I demanding that I get my own way today? Am I being irritable with myself or others today? Am I forgiving myself and others today? Am I being just and fair in my treatment with myself and others today? Am I being truthful and honest with myself and others today? Am I not giving up on myself or others today? Am I trusting and confident in God today? Am I hopeful about outcomes today for myself and others? Am I persevering through each circumstance today? Since I am human, and not the source of real Love, I have moments when I am not being loving to myself or others, but I can tell you after years of consistent practice, I have become much more loving in my thoughts, words and deeds. The benefits I have reaped from becoming more loving are better self-esteem, deeper connections in my relationships, a better relationship with God, less anxiety and a peace that I never had before. I want all of this for you too, and more. May real Love give you a life where your hearts desires are being manifest each day. PreviousPrevious post:Do You Have Symptoms of Depression?NextNext post:Are You Still Affected By Your Past?